Annapolis Mourns Employees Killed In The Capital Gazette Attack Five people were fatally shot while doing their jobs at the newsroom on Thursday. Devastated and in mourning, hundreds gathered across the city on Friday to honor them. 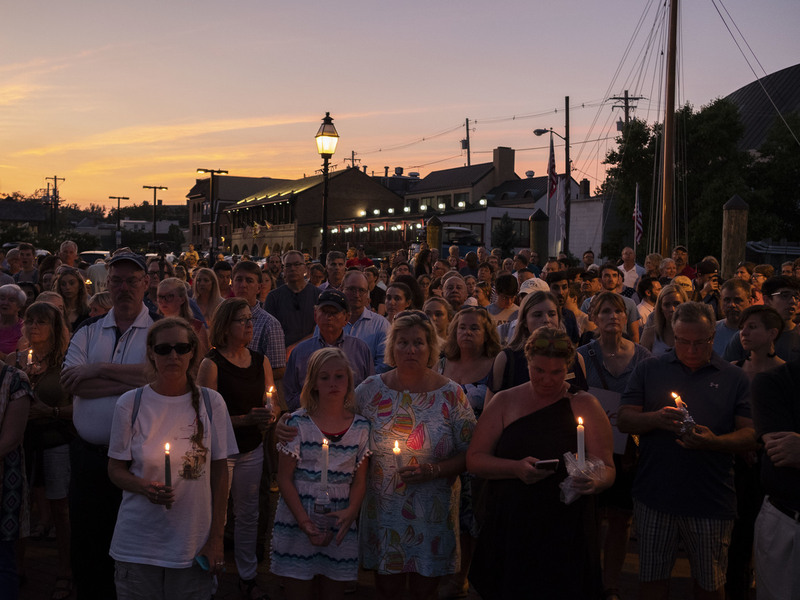 A crowd gathered in downtown Annapolis on Friday to honor five people who were killed in Thursday's attack on the Capital Gazette offices. Some people gathered at the Unitarian Universalist Church of Annapolis to mourn the loss of a longtime member who was slain in the office. A rendition of "Amazing Grace" on a bagpipe echoed through the crowded streets. Mourners carried signs that read "We are heartbroken" and "Annapolis Strong." "We are not the enemy," Capital reporter Pat Furgurson told people who attended a candlelight vigil, sister publication The Baltimore Sun reported. "We're you." Employees stood with their arms around each other, amid family members, friends and supporters. Reporter Phil Davis took a microphone and read the names of colleagues who lost their lives in the gunfire. "The reason we want to say the names is because we are not going to forget them and we don't want other people to forget them," he said. 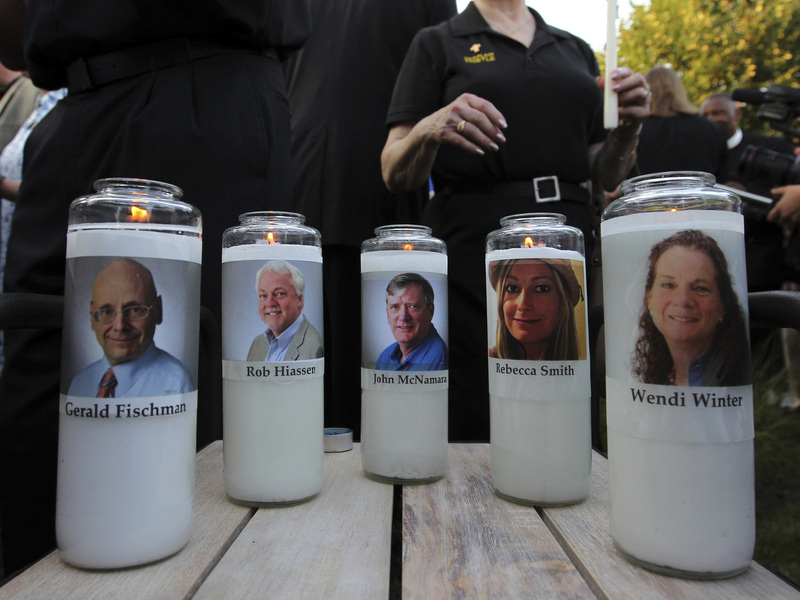 Photos of slain employees adorned candles at a vigil across the street from where they were killed in the newsroom. Killed on Thursday were Rebecca Smith, a 34-year-old sales assistant, John McNamara, a 56-year-old editor and sports writer, Gerald Fischman, a 61-year-old editorial page editor, Wendi Winters, a 65-year-old special publications editor and Robert Hiaasen, editor and columnist, aged 59. "I talked to Rob [by phone] Thursday morning — he talked about a headline clarification," Capital Gazette reporter Chase Cook told NPR. He was at home in Washington when the attack happened. "It's two worlds now." He said the reality of Thursday's attack hadn't truly set in yet. The paper, like any publication, had amassed some disgruntled readers, he said, but "a lot of the times it was just people calling us 'The Crapital,' getting upset at how we portrayed anything. I don't think anybody in their right mind, here or anywhere in the rest of the country, would think it would come to down this." The man charged with the attack, Jarrod Ramos, sued the newspaper in 2012 for defamation, then took his criticism to social media after his lawsuit was dismissed. Police say he used a pump-action shotgun in the attack. He barricaded the rear exit of the building to prevent people from escaping, the Anne Arundel County state's attorney says. Ramos faces five counts of murder. Cook spent most of Friday at The Baltimore Sun, preparing the weekend paper with a colleague who survived the shooting. Then he headed to the sunset vigil in downtown Annapolis, near the water. "There were more people than I anticipated," he said. "It was wonderful that they showed up." He added, "Wendi and Rob would have loved the vigils. They would have all been there if it was us."